Go here to see a larger version of the street closure map. If you're planning on driving in D.C. in the days surrounding Donald Trump's inauguration, expect major road closures downtown and near the National Mall. Many of the road closures go into effect Thursday and will last through Sunday. The Metropolitan Police Department has released a list of the expected closures and restrictions, but additional road closures are possible. • 14th St. non-HOV bridge – Open to all traffic. 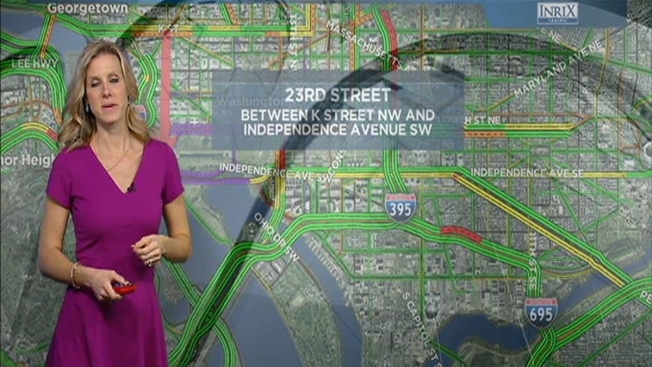 ALL traffic diverted to I-395. Vehicle traffic will be restricted to authorized vehicles only, with proper vehicle placards. Parking Restrictions (Posted Emergency No Parking with Ticketing and Towing Enforcement) Start: noon, Wednesday, Jan. 18. End: 1 a.m., Monday, Jan. 23. Vehicle traffic will be restricted to residents or businesses within the restricted area. National Guard personnel will assist with verifying traffic entering into the Green Zone. Parking Restrictions (Posted Emergency No Parking with Ticketing and Towing Enforcement) Start: 7 a.m., Thursday, Jan. 19. End: 1 a.m., Saturday, Jan. 21. U.S. Capitol and Metropolitan police will enforce closures on Capitol Hill. Vehicle traffic will be restricted to authorized vehicles only, with proper vehicle placards. No public parking will be available. • East Capitol St. from First St to Second St. Streets will reopen after the parade, which is expected to end about 5 p.m. The following closures and restrictions went into effect near the Lincoln Memorial at 4 a.m. Jan. 19 and will last until the event concludes about 6 p.m.
• Parkway Dr. NW from Ohio Dr. NW to Lincoln Memorial Cir. The following restrictions and closures will be effective in the area surrounding Union Station from noon until 11 p.m. Jan. 19.
o May be subject to temporary closures from 12 p.m. to 11 p.m.
Go here to see a larger version of this map.